"When drought comes to Montana, fire comes with it" - John Gatchel, Subcommittee on Forests and Public Land Management Hearing Testimony, September 22, 2000. "It is well known that many drought years come in cycles. . .In the fairly wet years the loss [of timber to fire] is small; the big acreage burned comes intermittently in real drought years. . . In my time as a forester in this region I have lived through at least nine years which could be classed as really bad forest fire years: 1910, 1914, 1917, 1919, 1925, 1926, 1929, 1931, and 1934. . .In a bad fire season - from the first of July until the September rains - one lives, breathes, and thinks nothing but fire." - Elers Koch (1998). Every year has its forest fire season. But not every fire season is as remarkable as that of 1910, 1988, or 2000, when fires burned through millions of acres of Western forestland. Why do some years bring more fire than others? In general, annual patterns of fire occurrence are dictated by fluctuations in the levels and dryness of forest fuels (Kipfmueller and Swetnam 2000, Pyne 2001). As Pyne (2001) explains, "places that are normally wet, and hence fluffed with combustibles, become available for burning during times of dryness; places that are normally dry require an outbreak of exceptional rains to sprout the grasses and forbs on which fire can feed." 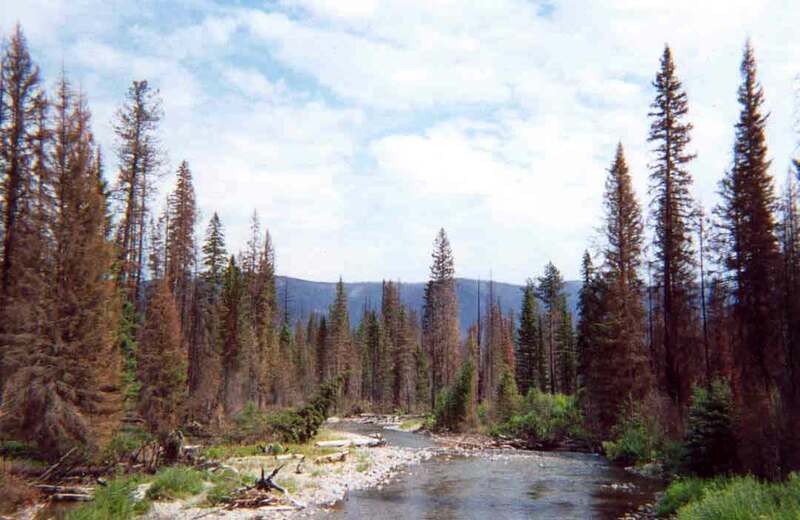 The region's dry montane forests, for example, can burn in just about any year that enough fuel is available, and they are particularly fire-prone after a series of wet winters (Kipfmueller and Swetnam 2000). Wetter forest types, on the other hand, nearly always have fuel to burn. In years of average rainfall, however, much of this fuel remains too moist to carry fire (Pyne 2001). For these reasons, the annual number of fires and acreage burned within low-elevation dry forests has been deemed fuel-limited, while patterns of fire occurrence in more mesic forests, including many moist montane and lower subalpine stands, are largely "weather dominated" (Agee 1997, also Bessie and Johnson 1995). Following normal snows during the winter of 1909-1910, a drought set in at the beginning of April. The mountains browned. Crop failures throughout the region reached such an extent that by July 10 the Northern Pacific Railroad was laying off men by the thousands. Southwest winds passing over the arid Columbia Plain desiccated the vegetation further. And fires broke out. Fires appeared in June, increased in frequency through July and August, exploded into conflagrations on August 20 - the celebrated Big Blowup - and only subsided in September with winter rain and snow . . . The 1967 season showed classic form. Rains ceased by mid-July, and soon afterward fire danger registered "extreme" for 59 consecutive days. The condition was regionwide, extending over the Pacific Northwest as well as the Inland Empire. In all, more than 5,000 fires were reported; 30 exceeded 1,000 acres. For the Northern Rockies the fires came in traditional bursts. On July 12, 131 fires were reported, 118 from lightning. The storm was accompanied by rain, however, and burned losses amounted to only 600 acres. On the twelfth of August a dry lightning storm set 167 new fires. Others followed. Ninety-seven began on September 6. On September 21 another 167 fires resulted. Before the season concluded, lightning had ignited more than 1,400 fires. In both cases dry, windy weather aided the spread of crown fires over vast acreages in a matter of days. During the Big Blowup of 1910 over two million acres of Idaho forestland burned in two days of "the driest month ever, of any month, since the onset of reliable records in 1894" (Pyne 2001). The Sundance Fire of August 1967, however pale in comparison to the Big Blowup, sped across 50,000 acres of the Idaho Panhandle National Forest, running treetop to treetop, in just nine hours (Pyne 1982)! Not coincidentally, the notable fire seasons of recent years, including those of 2000, 2001, and now 2003, occurred as western Montana and northern Idaho experienced moderate to severe drought (NIFC 2001, Anonymous 2003). More information on past and present drought conditions in Montana is available from the Montana Natural Resource Information System. Idaho data are available on the National Climatic Data Center's website. National Fire Weather forecasts are also available online. Agee, J. K. 1997. The severe weather wildfire - too hot to handle? Northwest Science 71:153-156. Arno, S. F. 1976. The historical role of fire in the Bitterroot National Forest. USDA Forest Service, Intermountain Forest and Range Experiment Station, Research Paper INT-187. Bessie, W.C., and E.A. Johnson. 1995. The relative importance of fuels and weather on fire behavior in subalpine forests in the southern Canadian Rockies. Ecology 26:747-762. Koch, E. 1998. Forty Years a Forester: 1903-1943. Mountain Press, Missoula, Montana, USA. Kipfmueller, K. F., and T. W. Swetnam. 2000. Fire-climate interactions in the Selway-Bitterroot Wilderness Area. Pp. 270-275 in D. N. Cole, S. F. McCool, W. T. Borrie, J. O'Loughlin, compilers, Wilderness science in a time of change conference - Volume 5: wilderness ecosystems, threats and management. USDA Forest Service Rocky Mountain Research Station, Proceedings RMRS-P-15-VOL-5. National Interagency Fire Center. 2001. Statistics and Summary. Available online at http://www.nifc.gov/news/2001_Stats_Summ/Intro-Intell_PredServ.pdf. Pyne, S. J. 2001. Year of the fires: the story of the great fires of 1910. Penguin, New York, New York, USA.